Before you can import and work with your project footage or animation in After Effects, you first need to know the tools you have in front of you and to understand how each of them can help you with your project. When you open After Effects, you will see a menu at the top of your screen. We’ve numbered each of these menu selections based on their order in the menu and provided a short description for each. 1. 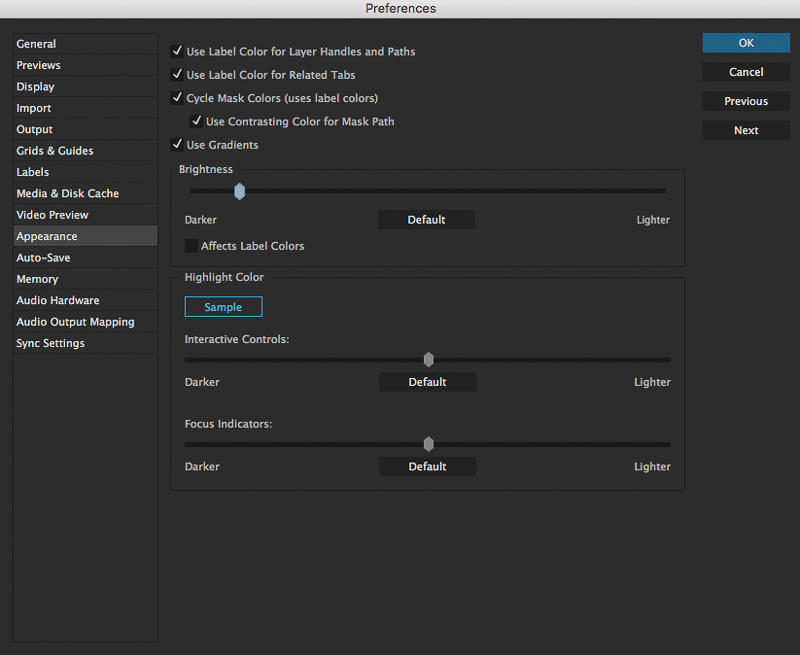 After Effects CC – This is a very important menu for program preferences. 2. File – This menu allows you to open, save, import, and export files. 3. Edit – This menu includes the cut, paste, duplicate, history, and redo functions. 4. Composition – With this menu you can create compositions, toggle settings, and set the render output module. 5. Layer – This menu controls layer creation, settings, style, and precompose options. 6. Effect – This menu provides a list of possible effects for your composition layers. 7. Animation – This menu includes functions for animation presets, keyframes and expressions. 8. View – With this menu you can adjust resolution, zooms, 3D toggles, and guides. 9. Window – This menu lists of all possible panels or frames you can open. 10.Help – From this menu you can access Information based on search or direct guidance for proper use. In first menu, After Effects CC, you have an important drop down item titled Preferences, which gives you control over the program’s core customizations and options. General – Toggles for different components in the programs interface. Previews – Allows you to set your preview quality’s resolution. Display – Includes settings for motion path key frames and toggles for time and rendering. Import – Includes settings for still footage, sequence footage and import options. Output – Allows you to set size limits for segmenting output video. Grids & Guides – Allows you to change your grid colors and size limits. Labels – Allows you to create your own color scheme for labeling. Media & Disk Cache – Includes settings for disk cache and cache locations. Video Preview – Includes Advanced Mercury Transmission option, if applicable. Appearance – Allows you to adjust the color values of your workspace. Auto-Save – Allows you to adjust your auto-save timing. Memory – Allows you to adjust the memory usage for AE and your other programs. Audio Hardware – Selects the audio drivers you wish to use to play sound in AE. Audio Output Mapping – Allows you to specify map for audio output. Sync Settings – Allows you to sync your profile settings. The main toolbar is also in the upper left portion of your program window. The toolbar contains all the tools you need to create working files/layers in After Effects. By clicking the icons that have the smaller triangle in the bottom right corner, you can open up the drop menu, which provides more options within that specific tool selection. Once selected, some of the tools will open access to controls for active tools, as seen in the image above. Below, you can see the toolbar items that have more options within their drop menus. When you first open After Effects your workspace is set to standard mode. 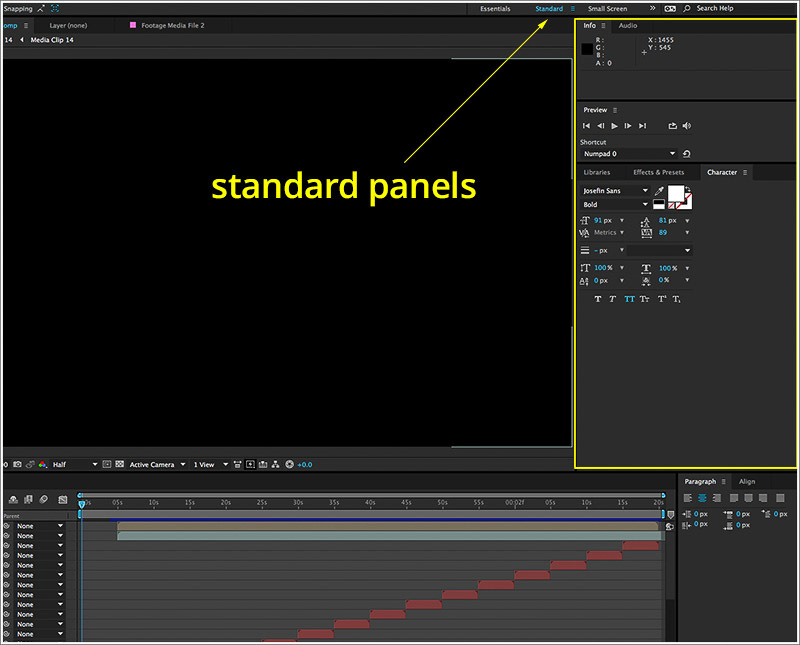 The standard AE workspace contains multiple panels as seen below. Each panel has its own name and individual functions. 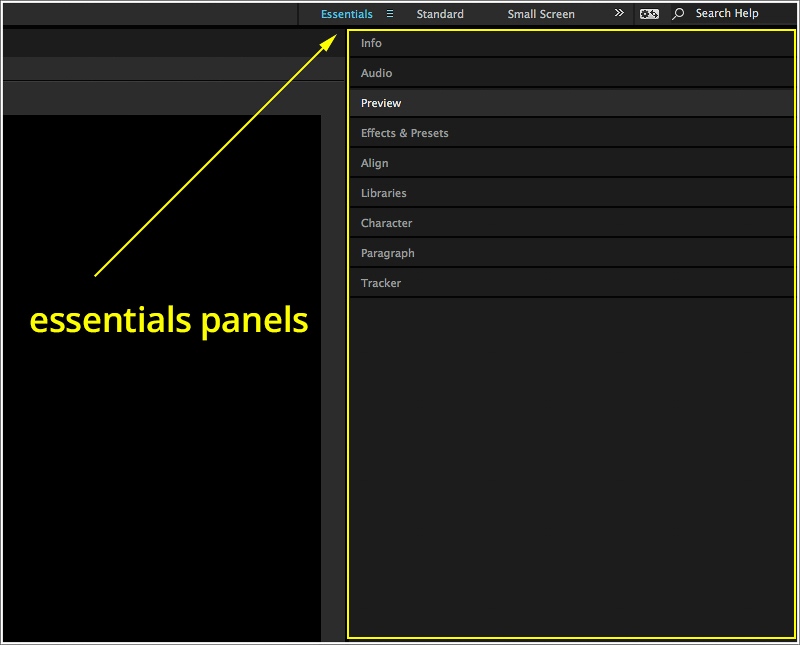 In AE CC you also now have the Essentials panel, which has all the basic panels you need in a stacked formation, allowing the user quick access to the right panels. You can also create your own custom workspaces by going to the Window tab in your main menu, turning on the panels and frames you want. Then within the same drop down you can click on Workspace and save your layout. Now that you understand the menus, let’s move on to working with footage.